It is informed to all students of Undergraduate / Masters (16 years) degree programs Pattoki & Jhang Campus up to session 2017-18 who applied in PM Laptop Scheme Phase-V are directed to review merit list of PM Laptop Scheme Phase-V. The Laptop Distribution ceremony is going to be held on 14-02-2019 (Thursday) in their respective Campuses. The selected students of Pattoki Campus will collect their laptops from Auditorium Hall at 10:00 a.m to 3:00 PM. 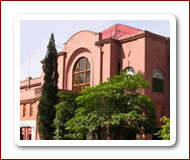 The selected students of Jhang Campus will collect their laptops from Auditorium Hall at 11:00 a.m to 3:00 PM. The selected students are directed to bring Original CNIC along with its two copies, One Passport Size Photograph and an Affidavit on Stamp Paper of Rs: 20/- to receive their laptops, failing which students will not be entertained in any case. Presence of the selected student for receiving of PM Laptop is compulsory, failing which student will not be entertained in any case. Those students who have canceled or freeze their degrees are not eligible for laptop. In case of any query, the undersigned may be contacted.